Experience the drama and mystery of South America’s greatest civilization, on a tour package that takes you from the imperial capital of Cusco and along the sacred pilgrimage route of the Incas all the way to world wonder Machu Picchu. You’ll acclimate for the trek while touring the sights in Cusco and the Sacred Valley, visiting places like the Plaza de Armas, the Cusco Cathedral, Sacsayhuaman, Pisac, and Ollantaytambo. Then you’ll embark on the Inca Trail on a thrilling 4-day walk past fascinating Inca ruins, over the famous Dead Woman’s Pass, and into the cloud forest, ending at the Sun Gate entrance to Machu Picchu. 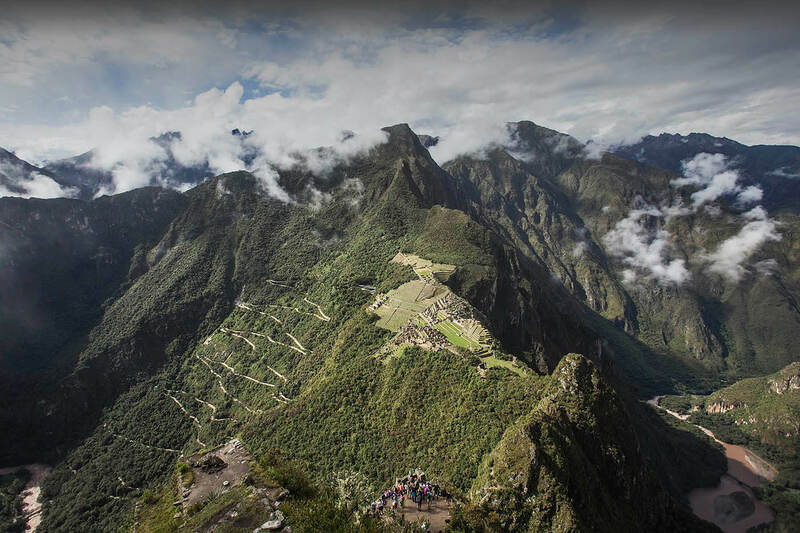 It’s been called the world’s greatest trek and it leads to South America’s greatest wonder, Machu Picchu. Contact us when you’re ready to begin planning your trek. *Please let us know as soon as possible if you are interested in booking the Inca Trail. Only 500 people per day (including guides and porters) are allowed to enter the Inca Trail and permits are regulated by local authorities. During the high season (June/July/August), it is best to secure your Inca Trail permit at least 6 months in advance. During the rest of the year, we recommend securing your Inca Trail permit at least 3 months in advance. At the end of the tour, you’ll be dropped of at your hotel in Cusco, where you’ll sleep one more night at altitude before the start of the trek. Transfer from Cusco to the start of the Inca Trail trek at Piscacucho km 82. After crossing the trailhead checkpoint, you’ll walk on a mostly flat trail to the community of Miskay, take a short rest, and then continue on a steeper path to the first archaeological site at Patallacta. After lunch, you’ll continue walking for about 2 hours until you reach the first campsite at Wayllabamba. The second day of trekking is the most difficult due to the terrain and the altitude, but also the most rewarding for the gorgeous views you’ll get along the way. You’re encouraged to find a pace that’s most comfortable for you. After breakfast, you’ll begin the climb to Abra de Warmiwañusca, known in English as “Dead Woman's Pass,” at over 13,700 feet (4,200 meters). On the other side, a stairway path descends steeply into the Pacamayo Valley and your campsite for the night. Today you’ll be treated to the trail’s most impressive archaeological sites which are scattered between the trek’s final two passes, Runkurakay and Phuyupatamarca. You’ll begin with an uphill climb to the circular ruins of Runkurakay, continuing on to the ruins of Sayacmarca or “Inaccessible Town” and the Phuyupatamarca. At day’s end you’ll arrive to the last campsite at Wiñay Wayna. Tonight you’ll have dinner and celebrate the near completion of the trek alongside the trekking staff who have accompanied you this far. The cooks and porters will walk ahead of you the next morning to catch an early train back to Cusco. Remember, it is customary for trekkers to contribute to a tip pool, which will then be distributed amongst the staff (guide, cook, and porters). A good tip amount ranges $10-$40 USD per hiker. These tips are voluntary, so feel free to tip according to the service you received. Wake early for breakfast and then start walking the final stretch of the trail to Inti Punku, the Sun Gate entrance to lost Inca city. Descend the stone path to the Inca citadel. After a short rest, you’ll meet with your trekking guide for a 2-hour tour of Machu Picchu. You’ll visit the primary temples and palaces of the Inca citadel and then you’ll have time to explore the ruins on your own.